Chef Katie Button is a Southern chef with a scientific mind who honed her craft at some of the world’s best restaurants, including elBulli. 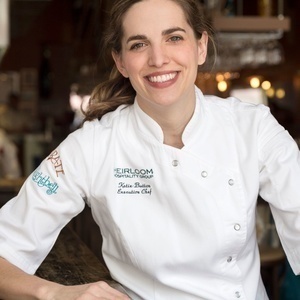 She is the executive chef and co-owner of Cúrate Tapas Bar and Nightbell in Asheville, North Carolina, where she has earned world-wide recognition and accolades. Chef Button is devoted to high-quality, sustainable cuisine and excellent service. Born in London and raised, chef Preeti Mistry’s innovative cooking is inspired by her multicultural background, Indian heritage and world travels. With almost 12 years in the industry, Preeti’s culinary adventure began at the prestigious Le Cordon Bleu Culinary Academy in London where she studied culinary arts. After moving back to the US she went on to hold Executive Chef roles at the deYoung Museum, the Legion of Honor in San Francisco and Google HQ in Mountain View, CA. She was also a contestant on season six of Bravo’s Top Chef in the U.S. Preeti is currently working on a cookbook set to be published by Running Press in Spring 2018.